Meet with over 25 non-profits on Thursday, May 23, 5-8 PM at the Safety Harbor Library to find your volunteer match. Mike Ivankovich, radio host of the ‘What’s It Worth? Ask Mike the Appraiser’ radio show in Philadelphia, will be at the Safety Harbor Public Library on Thursday, February 21 at 6:30 pm. 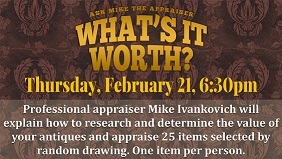 In an ‘Antiques Roadshow’style event, Ivankovich, professional appraiser, author auctioneer, and home downsizing expert, will explain how to research and determine the value of your antiques. Each attendee may bring one small hand-held treasured item for a chance to be appraised. Tickets will be given to those who bring an item and 25 lucky individuals will be able to have Ivankovich examine and determine the item’s worth. The Library is located at 101 2nd Street North, Safety Harbor. Call 724-1525 x 4112 for more information or visit www.SafetyHarborLibrary.com.